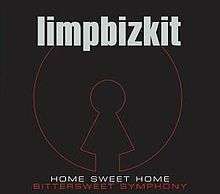 "Home Sweet Home / Bittersweet Symphony"
(2003) "Home Sweet Home / Bittersweet Symphony"
"Home Sweet Home / Bittersweet Symphony", also known as "Bittersweet Home" is a song by American rock group Limp Bizkit. It was released in December 2005 as the only single from the compilation album Greatest Hitz. The song is a medley of "Home Sweet Home" by Mötley Crüe and "Bitter Sweet Symphony" by The Verve. It is, along with the songs "Why" and "Lean On Me", the only new content on the Greatest Hitz compilation, and is the third cover song Limp Bizkit has released on an album (the others being The Who's "Behind Blue Eyes", and George Michael's "Faith"). The music video (which is included as a CD-ROM video on the single) is a blend of all the previous Limp Bizkit videos, taking scenes from them, as well as various other footage, including concerts, and backstage footage. At the beginning, however, the video shows a view from space, as the camera moves across the Earth, through a satellite, and finally zooms into Jacksonville, Florida, where the rest of the footage is then shown. ↑ "Austriancharts.at – Limp Bizkit – Home Sweet Home/Bittersweet Symphony" (in German). Ö3 Austria Top 40. ↑ "Danishcharts.com – Limp Bizkit – Home Sweet Home/Bittersweet Symphony". Tracklisten. Retrieved 2010-10-25. ↑ "Limp Bizkit: Home Sweet Home/Bittersweet Symphony" (in Finnish). Musiikkituottajat – IFPI Finland. ↑ "Italiancharts.com – Limp Bizkit – Home Sweet Home/Bittersweet Symphony". Top Digital Download. ↑ "Dutchcharts.nl – Limp Bizkit – Home Sweet Home/Bittersweet Symphony" (in Dutch). Single Top 100. ↑ "Norwegiancharts.com – Limp Bizkit – Home Sweet Home/Bittersweet Symphony". VG-lista. ↑ "Spanishcharts.com – Limp Bizkit – Home Sweet Home/Bittersweet Symphony" Canciones Top 50. ↑ "Swedishcharts.com – Limp Bizkit – Home Sweet Home/Bittersweet Symphony". Singles Top 100. ↑ "2013-08-24 Top 40 Rock & Metal Singles Archive". Official Charts. Retrieved 2013-08-30. ↑ "Limp Bizkit Chart History". Billboard. Retrieved 2013-04-25. ↑ "Billboard Hot Rock Songs". Billboard. Retrieved 2013-09-26.